Four-time world champion Sebastian Vettel has signed a three-year deal with Ferrari following Fernando Alonso's exit from the Italian team. The German's switch from Red Bull for next season was announced minutes after Alonso's departure was confirmed. "When I was a kid Michael Schumacher in the red car was my greatest idol. It's an incredible honour to get the chance to drive a Ferrari," said Vettel, 27. Two-time world champion Alonso, 33, will join McLaren. "It was a difficult decision to take, but a carefully considered one from start to finish," said Alonso. "My love for Ferrari was a prime consideration." "He brings with him that sense of team spirit which will prove invaluable when, together with Kimi, they tackle the challenges awaiting us, as we aim to be front runners again as soon as possible." "It was not a special moment of the year that I opened my eyes," he said. "Last year I had some doubts about 2014. "I knew that it was a big change of regulations so I thought best thing to check how the 2014 new turbo era was going for Ferrari. "I had a very close relationship with president [Luca] di Montezemolo. We talked every week and we more or less agreed that if this year we were not competitive again we could think of different options. "In the summer break it was time to sit with the president and say, 'OK, I would like to go'." The current season has one more race to run, with Britain's Lewis Hamilton battling Mercedes team-mate Nico Rosberg of Germany for the title at this weekend's Abu Dhabi Grand Prix. "Scuderia Ferrari has decided to put its faith in the youngest multiple champion in the history of Formula 1," said team boss Marco Mattiacci. Ferrari last won the world drivers' title in 2007, when Raikkonen finished top in his first stint with the Italian team. "Sebastian Vettel is a unique combination of youthfulness and experience," added Mattiaci. "Without a shadow of a doubt, these five years produced some of the best moments of my career and I also feel that, in leaving the team, it is family rather than friends I am leaving behind," said Alonso, who narrowly missed out on the world title to Vettel in both 2010 and 2012. "In the Scuderia Ferrari roll of honour of great drivers, Fernando Alonso will always occupy a special place," said Mattiacci. "If he can turn Ferrari into winners again - as his childhood hero and friend Michael Schumacher did two decades ago - he could attain legendary status." "We offer him our heartfelt thanks for what has been an extraordinary adventure with the Scuderia, when in the past five years, he twice came so close to winning the world championship." 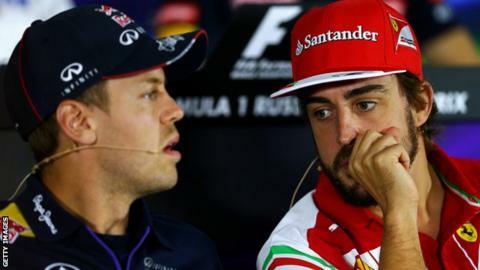 BBC Sport's chief F1 writer Andrew Benson says although Alonso may have failed to win a title at Ferrari, it is hard to judge his stay in Maranello as a failure. "Alonso's reputation as arguably the most complete F1 driver of all has only been enhanced by his battles against the odds in inferior cars over the last five years," said Benson. "Despite being considerably more successful in statistical terms, Vettel is not held in as high regard within the sport. "But if he can turn Ferrari into winners again - as his childhood hero and friend Michael Schumacher did two decades ago - he could attain legendary status."